Diastasis recti, also known as DRAM or abdominal separation, is a common occurrence during pregnancy and in the post-natal recovery period. Diastasis recti happens when the midline of the abdominals starts to stretch, causing a separation where your abdominal muscles should meet. The increasing weight during pregnancy combined with hormonal changes and altered posture can increase the load on the abdominal wall and result in stretching of the linea alba. 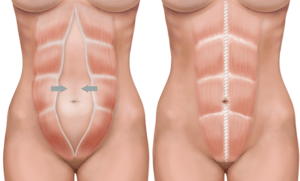 The linea alba is the connective tissue that connects the rectus abdominus muscles (the 6 pack) into the midline of the tummy and once stretched can cause a bulging/doming appearance of the tummy. Having diastasis recti can disrupt the transfer of pressure through the abdominal canister and result in issues such as low back pain, incontinence or prolapse. Diastasis recti wider than 2 fingers are considered abnormal. However it is not just the width of the linea alba that we are concerned about, the depth is important as well as how the core muscles are functioning under load. For example, Woman A may have a 3-4 finger width separation, but have no doming/bulging and core muscles that are able to transfer load very well in different positions. On the other hand Woman B may only have a 2 finger width separation but significant doming/bulging and poor transfer of load through the core ie. when performing movements such as lifting one leg off the bed. Some women are aware of this separation during their pregnancy, however most don’t realise until after birth. How will I know if I have abdominal separation? Practice good posture. You should be upright and tall, with a small curve in your lower back. Your ribs should sit on top of your pelvis. Make sure you don’t have an excessive sway in the lower back and try not to push your hips forward. Too much lower back sway can increase the load on your abdominal separation! If you think you might have abdominal separation, book in to see your local women’s health physiotherapist for a thorough assessment and management to ensure you prevent worsening during pregnancy and make a full recovery after birth. Does DRAM get worse with each successive pregnancy? Not necessarily. It will depend on how well you recover in between each pregnancy. This includes how much you close the gap and how strong and functional your core is. Each pregnancy is also different so it will depend on size of the baby, weight gain and how you carry. Do belly binding garments help? They do! They help to support the abdomen and reduce pressure on the midline. They will not prevent a DRAM but they can help to minimise the separation. Wearing a belly band should be used as a compliment to exercise, postural education and minimising risk factors such as straining, heavy lifting and constipation. Does wearing compression make a prolapse worse? Potentially. A belly band will slightly increase intra-abdominal pressure as it compresses the abdomen. For some women with prolapse this may make you more symptomatic. If it does, my recommendation would be to check in with your physio to make sure your pelvic floor exercises are going well and in the meantime stop wearing the belly support. Can you prevent abdominal separation? You can’t prevent it, as all pregnant women will have some degree of abdominal separation by the end of their pregnancy. However you can minise your risk factors so that your separation is not wider than necessary. This includes avoiding constipation, heavy lifting, poor posture and heavy abdominal exercises such as sit ups and planks. Should you bother working on your separation during pregnancy or just wait until after birth? There is so much you can do during pregnancy to optimise your recovery afterwards. Being mindful of your posture, keeping yourself fit and strong, avoiding the risk factors (as mentioned above) and wearing a belly bandage. This will all help you to recover better after birth! Will the gap ever completely close? Nope. It is not normal to have “no gap” as the 2 sides of your six pack muscles have to join together in the midline and naturally won’t be stuck right on top of each other. What is considered “normal” is a gap that is less than 2 fingers wide, which doesn’t bulge and allows you to function well without pain or discomfort. So in short, the aim shouldn’t be to have “no gap” but instead to have a less than 2 finger gap which doesn’t bulge and functions well! What are the best exercises to do to repair a DRAM? Great question! Check out my blog on abdominal recovery after birth for all the exercise goodies.